AMAL CARBURETOR is a British carburettor trademark. This was a British engineering company servicing the motorcycle and other light-engineering motor industries.Amal carburetor is used on Cooper Formula 3 racing cars and racing motorcycles. A carburettor is a device used in petrol or similar liquid fuel engines by means of which the fuel mixed with air, is supplied into the induction manifold of the engine. The main object of the carburettor is to supply the required quantity of fuel and air mixture of the correct strength as dedicated to the load condition of the engine. 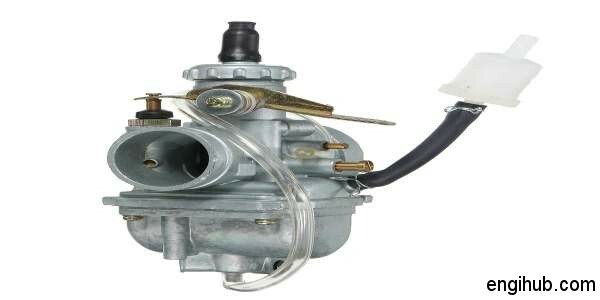 An Amal carburetor is used in small petrol engine which drives motorcycles and scooters. Amal carburetor is capable of maintaining uniform mixture strength throughout the throttle opening range. This is done by means of a tapered needle, adjustably attached to the throttle valve in Amal Carburetor. A throttle valve is fitted in carburettor body, to which a tapered needle is attached. The combination of the throttle valve and a tapered needle is operated by means of operating cable. To set the air-fuel ratio, the position of this tapered needle can be adjusted with respect to the throttle valve. The tapered end of the needle regulates the area of the passage in the main jet, supplies fuel to a chamber that has the pilot outlet and bypass outlet. An adjustable auxiliary air intake is also supplied air to this chamber. The pilot outlet and bypass are situated in front and back side of the throttle valve respectively. The float chamber is connected with a jet block, which contains main and pilot jet. This governs the level of fuel in the float chamber. The float chamber receives petrol from the oil tank through the needle valve, attached to the float with the help of a clip. The air valve, which can be operated independently by an Operating cable, to obstruct the main air passage. An adjusting screw is provided on the wall of carburettor body, by which the position of the throttle valve can be present independent of operating cable adjustment for idling purpose. The throttle valve remains closed at starting of the engine. The engine draws the mixture of air-fuel through the pilot outlet. This mixture carries excess fuel; such mixture is not desirable for normal running of the engine. Hence, the throttle valve is to be slightly raised for admitting supply of air from the main air passage. The more the throttle valve opened, the less will be the depression on the pilot outlet. But a higher depression will be created on the by-pass and now the mixture flows from this by-pass as well as the pilot outlet to compensate for accelerating period. The function of air valve is to obstruct the main air passage at the time of the start. Hence, enriching the mixture by increasing depression of the main jet. The mixture provided by the pilot outlet and the by-pass system is supplemented by the fuel from the main jet. At this point approximately at 13% of the throttle valve open. After the 75% of the opening of the throttle, the main jet only provides the fuel regulation. At the time of idling, the throttle stop screw provides a definite throttle opening for idling purpose. By this way, the air-fuel mixture is supplied to the engine cylinder of a motorcycle at various operating conditions.